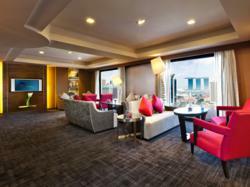 The Premier rooms and lounge at this prominent Clarke Quay hotel have been given a complete facelift. Rooms have been refurbished with a host of modern furnishings and amenities to make the stay more relaxed and comfortable. Novotel Singapore Clarke Quay, one of Singapore’s prominent business hotels ideally located within the city’s business and entertainment district, is pleased to announce the completion of upgrading work to its Premier Floors. The new-look Premier Floors feature a stylish modern look, designed to please the tastes of discerning business travelers. The renovation work included upgrade to all the Premier Floor Rooms as well as the Premier Lounge, which boasts amazing views over Marina Bay, Clarke Quay and the historical Singapore River. All Premier Rooms are now equipped with modern furnishings, fixtures and amenities. These include JBL iPod Docking Stations, Nespresso coffee machines, bed side master control panels, 42-inch flat screen TVs with a media panel system allowing seamless connectivity between portable devices and the in-room TV. These rooms now also feature upgraded bathrooms with a separate rain shower and bathtub. The Premier Lounge has been given a major facelift to enhance the overall ambience and comfort level of guests using the facility. The furniture, seating and lighting in the lounge have been carefully selected to combine sophistication in a friendly environment. In addition to the premier facilities, guests will also experience personalized service by the well-trained, dedicated Premier Lounge staff. Novotel Singapore Clarke Quay is taking the Premier Floor experience to a new level. Guests will enjoy express check in/out; Premier Lounge benefits including canapés and beverages during cocktail hours; free broadband and wireless internet access in both in the rooms and in the lounge; turndown service; boardroom access; and complimentary American breakfast in the Premier Lounge or International breakfast at the hotel’s famous The SQUARE Restaurant. Novotel Singapore Clarke Quay (http://www.novotelclarkequay.com.sg), is a premier business hotel situated in the heart of Singapore within the vibrant and dynamic Clarke Quay area. One of Singapore’s best located hotels, both for tourists and business travelers, Novotel Singapore Clarke Quay features 401 redesigned rooms each with magnificent and un-obstructed views of Marina Bay, Fort Canning Park and the meandering Singapore River. The hotel’s guest rooms have been upgraded to Novotel’s latest design standards, offering modern amenities such as flat screen televisions with media connectivity panels, including Nespresso coffee machines, iPod Docking Stations in Premier Floor rooms and modern workstations developed with the travelling executive in mind.